2018 prices available until December 31, 2018. Register today! New! Installment options for payments. OELC courses concentrate on leadership skills and abilities that will support and assist students in their leadership endeavours in their home schools and communities, and in preparation for the workforce. Each of our courses focuses on individual leadership styles, team dynamics and collaboration, communication, creative problem-solving, and organizational skills. For this reason, responsibility, inclusivity, community and global awareness are components of every course. We focus on engaging and educating youth to maximize their potential as leaders, encouraging them to participate and positively contribute in their schools, communities and beyond! Courses at the OELC are led and supported by qualified Teachers. Workshops consist of experiential learning opportunities that take place in indoors and outdoors led by experienced Teacher Facilitators, Outdoor Educators and Guest Facilitators. Each workshop is special and provides students with unique ideas that teach them about themselves and others. Experiences in workshops can positively affect their school and their communities. Workshops may include group initiatives, low ropes course, team building maze, escape rooms, Sherpa Walk, etc. Upon completion, students will receive a certificate for each SHSM certification completed. The OELC is happy to work with your school on specific SHSM certifications required. For more information, please contact the Centre at 705-689-5572 or email admin@oelccaso.com. 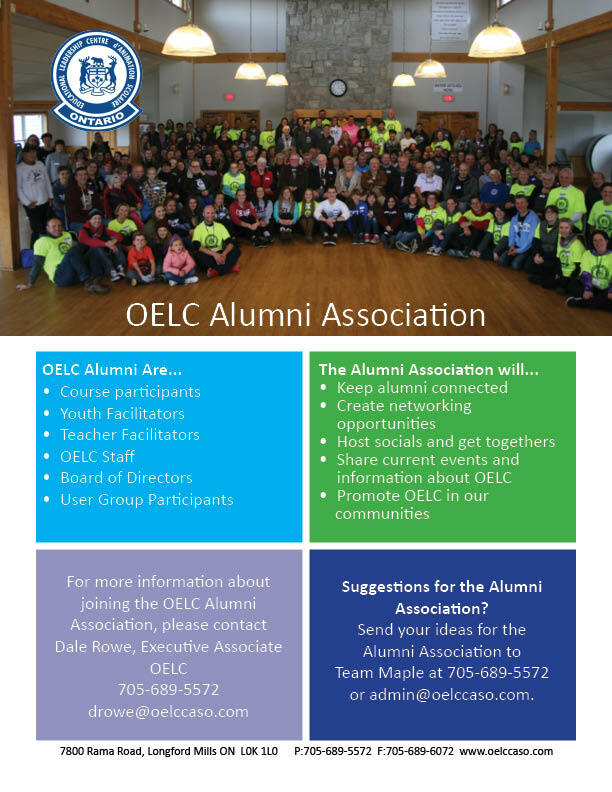 OELC has started an Alumni Association. If you have been involved in OELC in any way (course participant, YF, TF, staff, Board of Directors), join the Alumni Association by emailing admin@oelccaso.com. Click here for more information on OELC's Alumni Associaion. Mentor and assist others in making informed decisions that enhance their well-being. Develop leadership and event coordination skills. Promote the benefits of healthy, active living to others. We are pleased to announce that our Board of Director's member, Martha Deacon, has been appointed to the Canadian Senate. Congratulations Marty!